12:48 I just answered some interesting questions n the chat room. 9:58 on a move like this I just watch the 20 minute, 55 minute, and 110 minute EXMAs. The move is not over until it breaks the 55. 9:34 running into the Red Swan; will it "catch" ? We also have a hex pattern at 1845. These can stabilize prices. 3/28/2014 2:06:48 PM MT BBB****:: I believe you are correct but I do not hold overnight. 3/28/2014 1:49:12 PM MT Sharpe:: BBB, do you know when are you required to have the overnight margin for the sp500? Is it 4:15 EST? 3/28/2014 1:41:51 PM MT BBB****:: I am long at 1848.50 and will let it ride to the close. Been long for an hour or so. 3/28/2014 1:24:11 PM MT JSF:: I bought at the latest trade time, thinking that the tide was going to turn. 3/28/2014 1:11:21 PM MT Sharpe:: Well it looks like a continuation sell to me..
3/28/2014 1:03:36 PM MT Sharpe:: I took the crossover sell during the second tide time but got stopped out for even when prices had that little rally up to the 110 exma. I trailed my stop too tight and should have gotten at least +6 on the move down. 3/28/2014 1:02:09 PM MT Sharpe:: I'm watching to see if we get a crossover buy coming up here. The market looks like it reacted very strongly to the 14:57 tide time. 3/28/2014 12:59:30 PM MT Sharpe:: So I think one of the things that might be a bit relevant is the fact that he mentioned today that he uses his fractal's to determine which trades might have the best moves. That might be helping him cherry pick his trade a bit more. One thing I've decided on for the moment is that I'm going to stay away from the continuation trades. I'm doing a terrible job deciding which when to take continuation buys or sells so I'm just going to focus on the crossover trades which has been easier for me to identify and trade. 3/28/2014 11:43:13 AM MT Sharpe:: Do you find that you are taking a lot more trades then Al? 3/28/2014 11:11:20 AM MT Sharpe:: MRL, are you risking more then 3 points per trade? 3/28/2014 11:07:36 AM MT Sharpe:: Are you passing on this 2nd trade Al because we are 45 minutes past the moontide window? 3/28/2014 11:03:26 AM MT MRL:: Sharpe -- I give you my results -- I am was feeling like you some weeks ago. I have been trading AL�s systems 3 months and still flat. To take the losses and move on its important bc of risk management - but for some reason Al losses are few and small -- mine are not - when i use trail stops I get filled and Al get 9 points. No matter what system you trade you have to make it your own to match your personality. I think there is a lot of value but it not easy to transfer it to my account. 3/28/2014 11:03:07 AM MT JSF:: Al, do you recommend a futures broker? 3/28/2014 10:42:24 AM MT Sharpe:: One thing I've noticed so far and perhaps it's just my imagination but generally speaking it seems easier to trade the crossovers versus the continuations. The crossover setups seem clearer to me since compare to the continuations. Have you ever heard this before? 3/28/2014 10:38:51 AM MT Sharpe:: Wow, that's impressive then. My results so far haven't tracked yours very well but perhaps that's because I'm new and am still learning. 3/28/2014 10:36:26 AM MT Al****:: when I didn't actually make the trades I look at the charts and try to estimate what I would have done; I've had three different traders do my hotline while I was gone, and they get about the same results applying the rules. 3/28/2014 10:34:14 AM MT Sharpe:: Another question I had was around your history of results. There's some sort result for every trading day for the past 10+ years it looks like. I'm guessing you didn't take every single trade that's showing (you got sick, you were on vacation, etc) so are some of those results trades that you would have taken? 3/28/2014 10:27:12 AM MT Sharpe:: Do you use the fractals on every single trade? 3/28/2014 10:22:03 AM MT Sharpe:: Al, are all of your entries on the hotline trades from the 20/110 EMA or do you enter off any of your fractals? I know you mention your fractal patterns a lot so are you using those more for exiting or figuring out where a trade might go versus the entries? 3/28/2014 9:29:00 AM MT Sharpe:: Any advice Al on how to handle a potential entry that's right in the middle of two moontides? We have the 10:49 and the 12:17 times this morning and it looks like prices are currently moving down to potentially trigger either a continuation buy or a crossover sell. 3/28/2014 8:33:31 AM MT Sharpe:: Ok. Is the moon flux the yellow dotted lines on the chaos chart? 3/28/2014 8:25:01 AM MT Sharpe:: Good morning Al, I had two questions from yesterday's hotline trades. 1. On the continuation sell we had yesterday morning, what made you exit pretty much right at the bottom for +5 and 2. 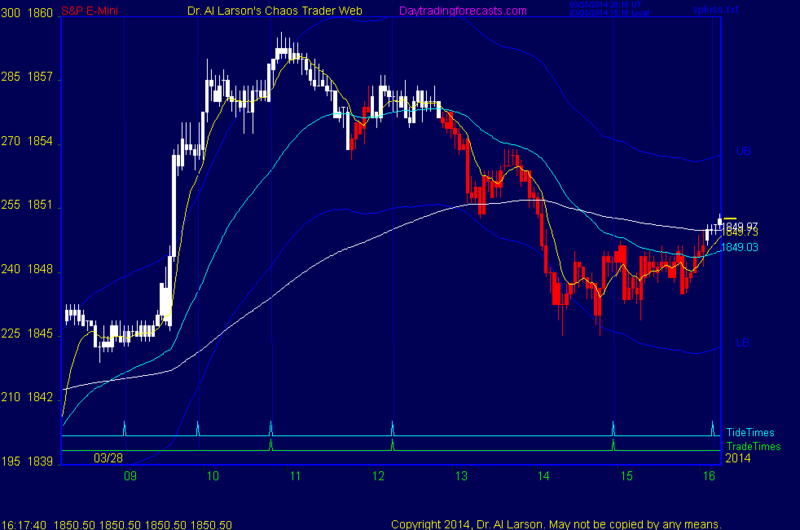 Was there a reason you didn't trade the crossover buy we had shortly after that bottom? 3/28/2014 7:04:43 AM MT BBB****:: Not a problem. If I know I cannot make this one, should I go ahead and put my email in in order to get on the list for the following course?